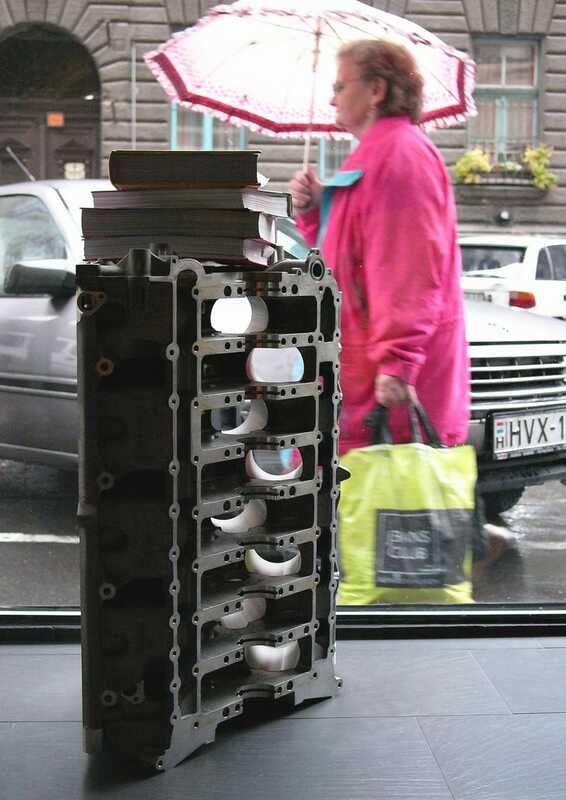 Stranger even than a Citroën SM in the Detroit suburbs is stumbling upon an 8-liter sixteen cylinder engine block from a $1.7 million Bugatti Veyron in a Budapest street. The first glance is barely cursory. Engine blocks, after all, are fairly common elements of a certain school of interior design. This one is standing on its end behind a plate of glass on a residential street in downtown Budapest. It’s rather tall, so definitely not a Chevy small block, most likely some sort of straight six from a truck. The block is almost waist-high and I’m 6'2"
Is that really a Bugatti logo stamped in the metal? So I rock back and forth on the sidewalk, trying in vain to bridge the vast chasm between what I see and what I know. Empirically speaking, the object cannot be anything other than a Bugatti Veyron engine: no other car has ever been manufactured with a W16 and engine blocks generally don’t carry the stamped initials of Ettore Bugatti in their metal. On the other hand, we’re talking about a ludicrously expensive car with perhaps 200 examples in existence. What are the chances of running into the dismembered engine of one in a shop window in Budapest? I might as well enter the store to find out. The space behind the plate of glass is the headquarters of Geppetto, a Hungarian design studio founded by the Elek brothers in 1996. A man descends the well-designed staircase. “Is that what I think it is?” I ask, cutting a glance at the engine block. “It indeed is,” comes the answer. Wordless shuffling commences. We then strike up a conversation. The guy turns out to be Peter Kucsera, one of the designers employed by Geppetto and creator of the Seeyou Project, a rather beautiful horizontal gravestone made of concrete. But how does one end up with a Veyron engine? We are standing in the middle of Geppetto’s generous studio space, flanking an inconspicuous metal crate which looks like a downsized shipping container. With a mischievous flick, Peter removes an Ikea carpet from the crate’s top. Under a glass cover, the crate is filled with the rest of the engine’s parts. Headers, camshafts, cylinder heads, a single piston, a lone turbo and the giant crankshaft which handles the 1001 HP the engine makes. The surreality of it all never quite fades away. I suggest using only one cylinder bore per generation, reserving it for the most deserving member of that generation, thereby stretching the block’s life into the centuries. The block could then remain put, its great heft planting it into the very earth, while the city surrounding it would evolve, the Geppetto office fading away to become a butcher shop, only for that to turn into yet another place of business. It would certainly make for a killer time lapse video. “We’ve yet to find the best use for it. For the moment, we’ve decided to install it in the shop window to serve as a conversation piece,” Peter says, adding that it does attract a strange assortment of passersby. I wave goodbye and return to the November gloom. Should you visit Budapest these days, you’ll find the block at this address. It really is quite a sight.